Dr. Sherry Molock has been teaching psychology for three decades. Just as she remains current in her field of psychology, she wants to remain current in the field of teaching. Supporting her in testing and refining her teaching methods are the University Teaching and Learning Center (UTLC) and Academic Technologies (AT). “We partner with professors who want to assess and improve their teaching,” said Dr. Patricia Dinneen, director of the UTLC. “It’s an ever-evolving field. We research and develop practices that support active, student-centered learning and foster student engagement.” Each year, the UTLC offers a weeklong Course Design Institute (CDI), exposing professors to active learning, and guiding them through the design of a new course or the redesign of an existing one. Active learning techniques flip the classroom. 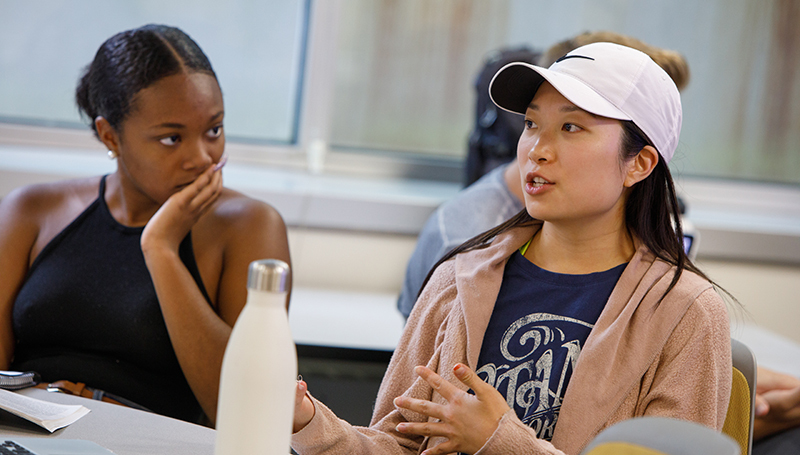 More time is spent for discussion and other activities that allow students to learn by doing and experiencing, rather than passively listening to information being shared one way—the sage on the stage model. But sometimes, instructors’ enthusiasm for active learning comes to a halt when they enter a traditional lecture hall. Chairs are bolted to the floor, forcing all students to face the same direction. The professor is tethered to the podium. While professors find ways to work around the configuration of the room, they can’t implement all the active learning techniques they’d like. 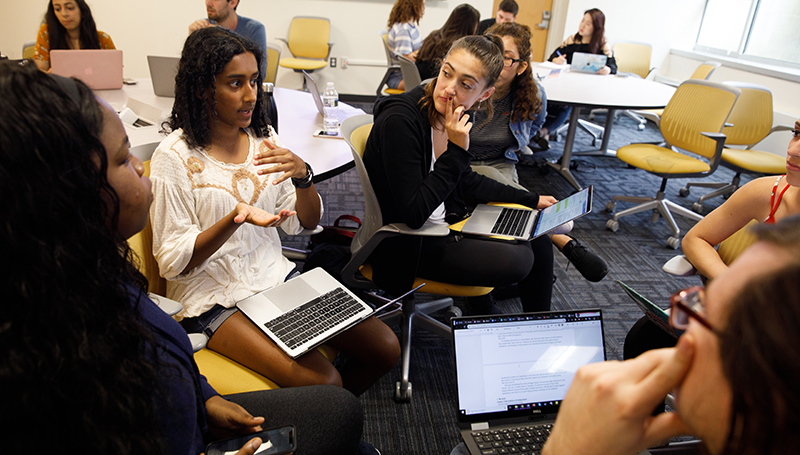 The connection between pedagogical techniques and physical space is what makes AT vital in supporting professors. Collaborating with colleagues in the UTLC and Instructional Technology Lab, as well as working directly with professors, AT identifies trends in teaching, assesses faculty needs, and tracks new technologies. Audiovisual engineers have designed several classrooms to support the needs of active learning, which are increasing each year. Chairs get wheels, allowing students to easily move between small group work and large class discussion. Whiteboards adorn three or four walls, eliminating the front of the classroom. Larger active learning labs include circular tables and display screens on multiple walls, which allow students to face one another in order to collaborate and discuss. “I can walk around with them and talk with them and interact with them,” said Molock. “Me doing that models them doing it with each other. It’s a much better environment because of that." 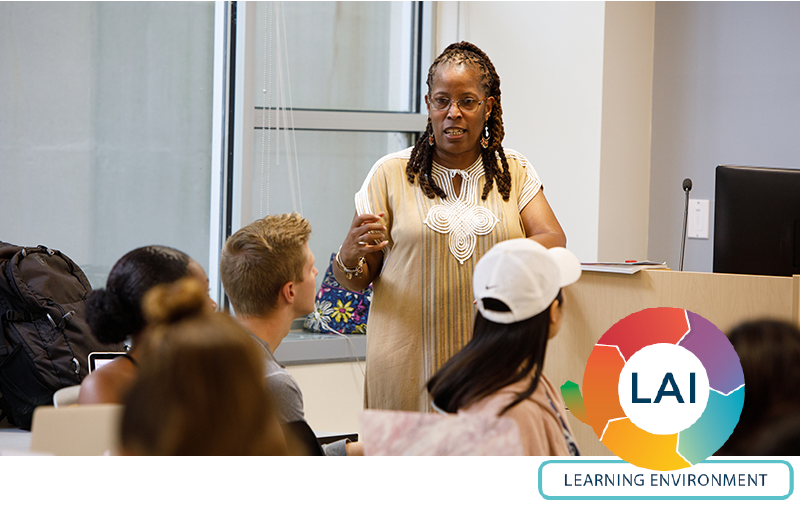 To learn more about supporting our teaching and learning programs, please contact Tracy Sullivan, executive director of development, GWLAI, at 202-994-8928 or [email protected].